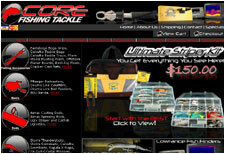 A full service striper fishing tackle shop that has an on-line e-commerce store for their fishing tackle. A Innovative product developer for the fishing industry as well as a retailer of specialized fishing products. 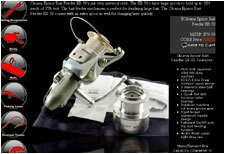 A full service fishing, hunting and boating accessories store. This web site was developed and designed to present the store online in the professional manner that the owner runs the physical store. A large nursery such as Riverbend has a large clientele who need a quick way to look up their inventory and see pictures and availability. This web site allows a user to perform a search with over 20 search criteria items to limit results to the perfect match. A fine furnishings retailer, Trocadero demanded a high-quality web site that showcased the unique and rare products that they market. Serving the prestigious Smith Mountain Lake area, Lakescapes builds unique outdoor environments that demand respect. Kingfisher built a web site to showcase their outstanding portfolio of accomplishments. Captain's Quarters at Smith Mountain Lake needed a web site quickly to assist in tourists looking for information and contact numbers. This web site was built to allow the marina to have an on-line presence for tourists to rent boats, jet skis and to see what all the marina provides. The purpose of this site was to provide a very informative fishing charter web site that ranked high in the search engines. 90% of The Shad Taxi's clients come from the web site. A high-class photography agency needs a high-class yet simple web site. This web site showcases all of the photographer's talents and portfolio.